The future of the Toronto Blue Jays’ rests squarely on shoulders of an 18-year-old and a 20-year-old prospect. Just the hopes and the dreams of a fanbase spanning the entire country of Canada … no pressure, right? 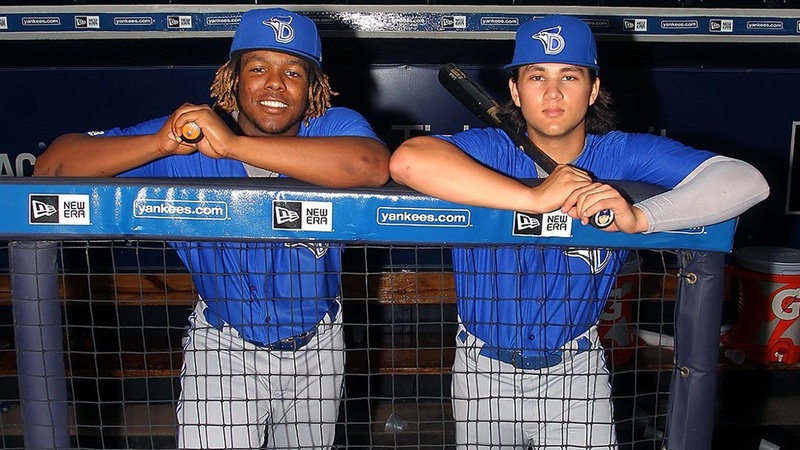 Vladimir Guerrero Jr. and Bo Bichette are the Blue Jays’ most highly coveted young players; ranked one and two in the farm system and ranked third and eighth best prospects in all of Major League Baseball (according to Baseball America). To say the anticipation and excitement are huge for these players would be a colossal understatement. Blue Jays fans awoke on Thursday with a pleasant surprise; Guerrero and Bichette were both on the lineup card against the Blue Jays’ Spring Training tilt against the Baltimore Orioles. Ordinarily, there wouldn’t be much attention paid to a Spring Training game like this, but it was the first opportunity where both of the Blue Jays prospects faced Major League talent for the very first time. The ‘Vlad and Bo Show’ did not disappoint. Guerrero got into the game as the Blue Jays’ designated hitter and finished up the day by going 4-for-5 with four – yes four – singles. He reached base in all but one of his plate appearances. Just the mere sound of the ball off of Vlad’s bat is enough to get anybody excited. Bichette didn’t start the game, but came onto the field as a pinch-runner in the third inning and played the final seven innings of the game at shortstop. He demonstrated why he won a Minor League batting title in 2017, going 2-for-3, with a pair of singles. Yes, it was only one game. Yes, it’s an extremely small sample size. But these guys lived up to the hype … and then some. Since Guerrero and Bichette play their games at the lower level of the minor leagues, most fans don’t get the opportunity to see these two up close. For those in attendance today at Ed Smith Stadium in Florida, they got the chance to see what kind of damage these prospects could do for the Blue Jays in the coming years. Not to mention, the Blue Jays’ third-best prospect, Anthony Alford, also had himself a day. Alford hit pair of doubles and a triple on the way to a 3-for-4 day against the Orioles. The outfield prospect now has six extra-base hits in 10 Spring Training games; that’s the most extra-base hits for any Blue Jays player thus far. Guerrero and Bichette may be a few seasons away from making their way onto the Blue Jays’ 25-man roster, but the future is extremely bright for these two prospects. Interestingly enough, both Guerrero and Bichette’s names were mentioned in potential trade talks this past offseason. At no point did the Jays’ front office confirm they were shopping their two best prospects, but Guerrero and Bichette’s names were rumoured as centrepieces for potential trade offers. If anything, Guerrero and Bichette proved why the Blue Jays didn’t, and shouldn’t, ship off their two best prospects; because they could develop into superstars themselves. If their Spring Training debuts were a tiny glimpse into the kind of players they could become, faithful Blue Jays followers should start saving their nickels for Guerrero or Bichette jerseys.